Hiking boots are critical to your comfort and performance on the trail, but this no longer means a stiff and burly model that will weigh you down. 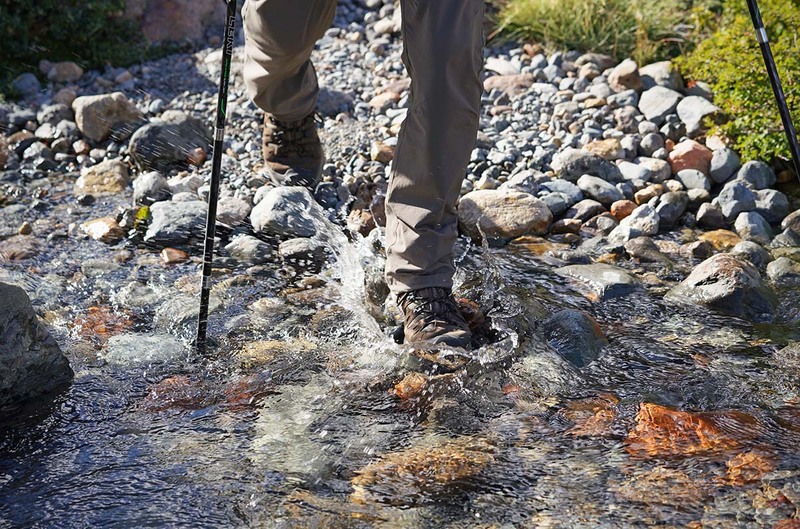 The trend is toward lighter materials that still offer decent support, and waterproof boots are the most popular by far (many are offered in a non-waterproof version for hiking in hot or dry climates). 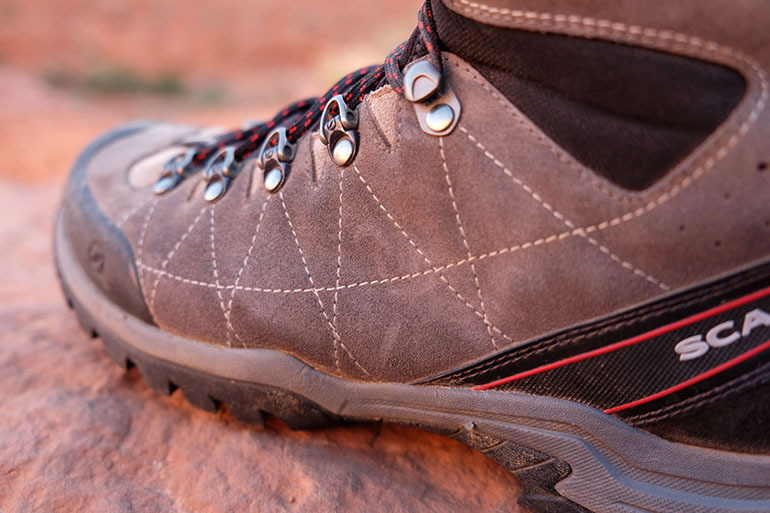 Our picks for the best hiking boots of 2019 below are broken down into three categories: lightweight boots for day hiking and fastpacking, midweight options that work well for most backpacking trips, and heavyweights for rough terrain or hauling a large load. For more information on choosing the right boot, see our comparison table and buying advice below the picks. If you prefer to go even lighter and faster, see our article on the best lightweight hiking shoes. What we like: Fast, light, flexible, and reasonably priced. What we don’t: Thinner underfoot and less stable than the Salomon Quest 4D below. 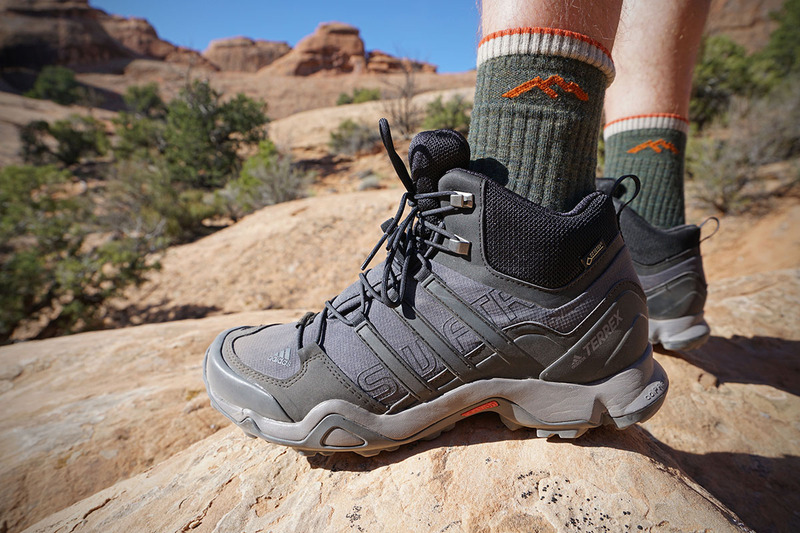 Built like a trail-running shoe but with added ankle support and protection, the Salomon X Ultra 3 Mid is our favorite all-around hiking boot for 2019. These boots offer an impressive combination of comfort and low weight, all while retaining solid toe protection, a stable chassis, and an improved lug design that grips exceptionally well. You also get Salomon build quality, which tends to stand up to more abuse on the trail than other boots in this weight and price range. For fast-moving day hikers, lightweight backpackers, and even thru-hikers, we heartily recommend the X Ultra 3 Mid. What we like: Great price, fit, and comfort. What we don’t: Not as supportive for rough trails or heavy loads. 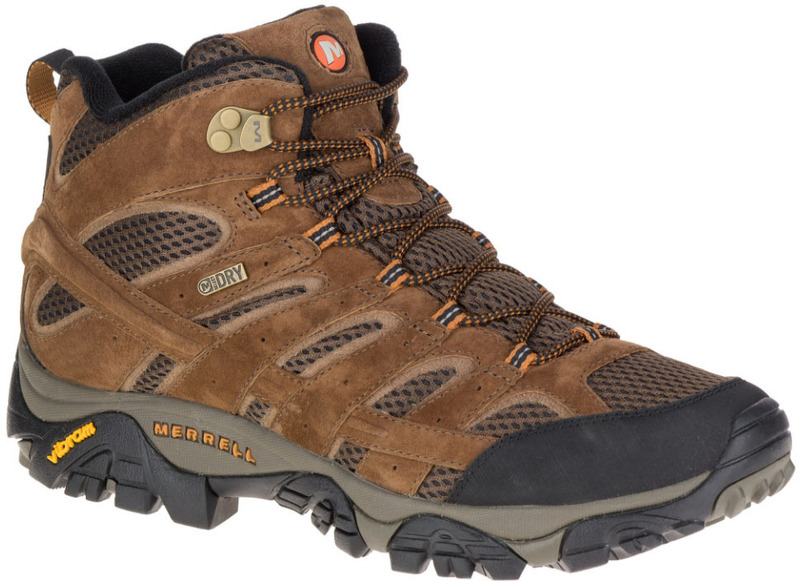 For day hikers and lightweight backpackers who stick mostly to maintained trails, our top value pick is the Merrell Moab 2. What makes this boot so popular is its lightweight and comfortable feel at such a reasonable price. For $130, you get good cushioning underfoot, trusty Vibram outsoles, and a waterproof membrane (an upgraded Gore-Tex model is available for $150). The Moab was updated to the "2" a couple of years ago, but they didn't fuss much with the proven design. Notable changes included a new insole with a higher arch, improved cushioning under the heel, and a more waterproof and durable suede upper. What we like: Tough and supportive yet comfortable. What we don't: Pretty heavy and overkill for most day hiking. If you’re in the market for a tough boot for serious day hiking and backpacking, Salomon’s Quest 4D 3 GTX is the whole package. Updated last year, this boot adds an aggressive outsole that grips well in just about all conditions, along with a redesigned, more flexible platform for improved comfort. What stays consistent is the top-notch performance fit, aggressive stance, and durable construction that has made the Quest one of our favorite all-around hiking boots for years. What we like: Light and comfortable; enough support for most backpackers. What we don’t: Not the toughest construction. 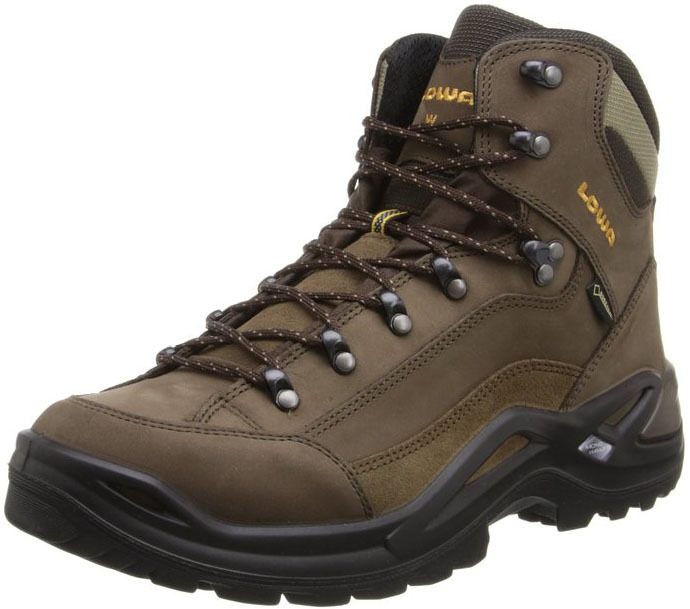 The Lowa Renegade has the look and feel of a traditional hiking boot at an impressively low weight. Unlike the nimble and more modern Quest above, the leather Renegade offers better isolation from the ground and feels more planted and sturdy. It does give up a little of the fun factor and performance fit of the Quest, but the trade-off is worth it for those carrying a heavy pack or wanting more underfoot protection from rocky trails. 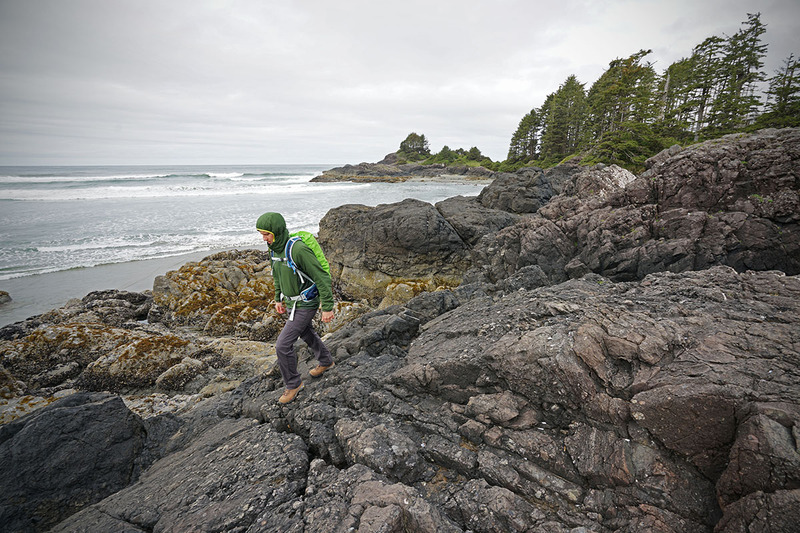 What we like: Reasonably light but stiff enough for backpacking over rough terrain. What we don’t: Overkill for maintained or moderate trails. 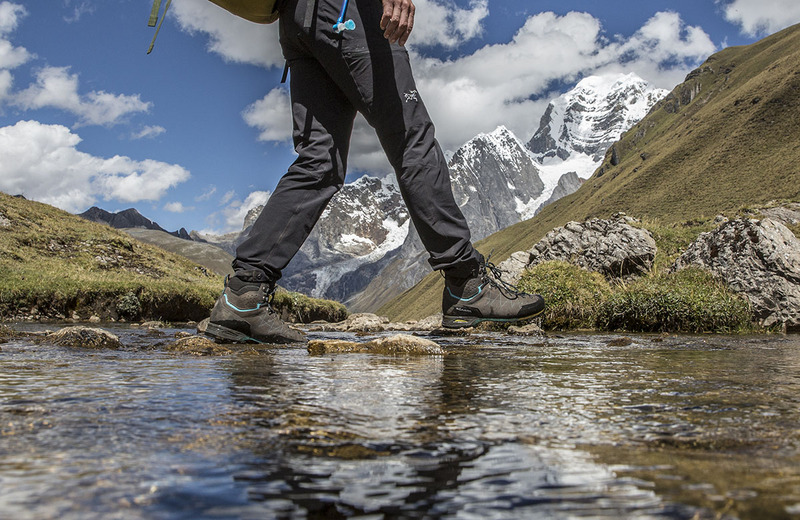 For a recent trek over the harsh terrain of Peru’s Cordillera Huayhuash, we turned to Scarpa’s Zodiac Plus. This boot mixes approach shoe-like traction on rock and boulders with the toughness and stability of a lightweight mountaineering boot, which is quite a combination. 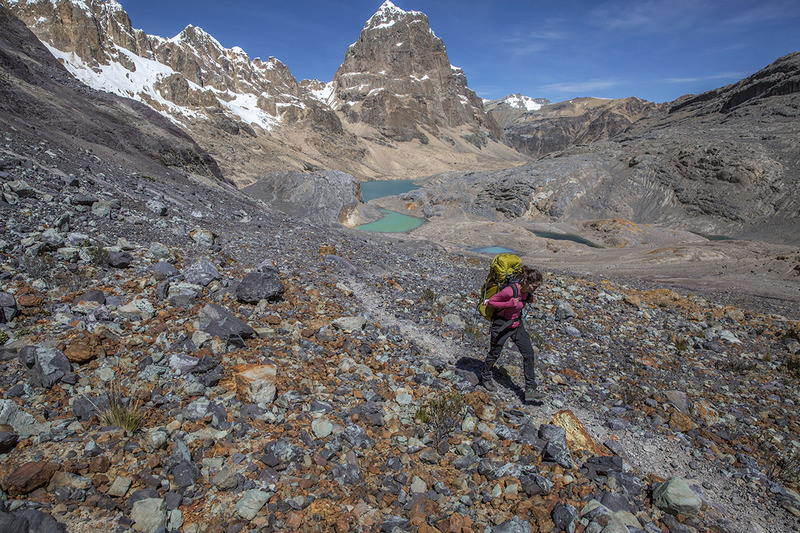 Over a brutal 10 days of on and off-trail hiking while shouldering a heavy pack, the Zodiac impressed: the semi-stiff build, high quality construction, and solid protection provided a lot of confidence on steep climbs and sketchy descents. What we like: Good price for a tough and comfortable shoe. What we don’t: Poor ventilation and the fit may be too snug for some people. 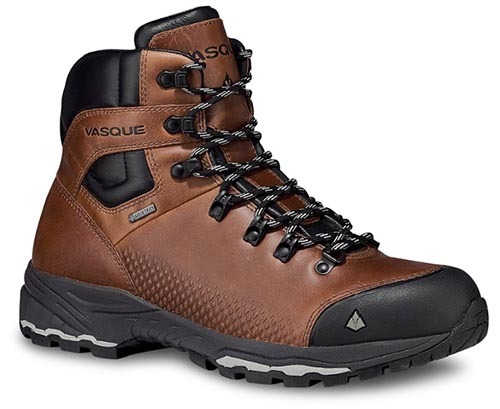 Vasque’s Talus Trek is a solid addition to their hiking boot line-up, designed to tackle wet and rocky trails. Right off the bat, we were very impressed with the build quality and feel of these boots. The leather upper is strong and handled muddy hiking and snow travel with ease (the Talus quickly became a favorite for mild weather snowshoeing). 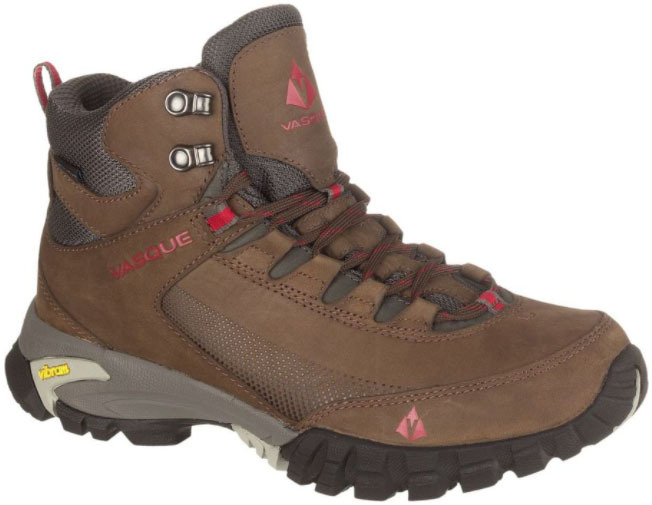 The Vasque also has excellent foot protection for the price with a rigid toe cap and heel piece. All in all, the boot doesn’t have the same performance feel of the Salomon Quest 4D 3, but is a solid partner on the trail and a great value at $150. In price and performance, the Talus Trek UltraDy is a nice mix of the Merrell Moab 2 above and the popular Keen Durand. The leather upper is a step up in durability from the mesh-heavy Moab, but the Talus is a significant 5 ounces lighter in weight than the Durand while providing comparable ankle support. We did find that the toe box was quite a bit tighter than the competition, so those with wide feet may want to steer clear of the Vasque. 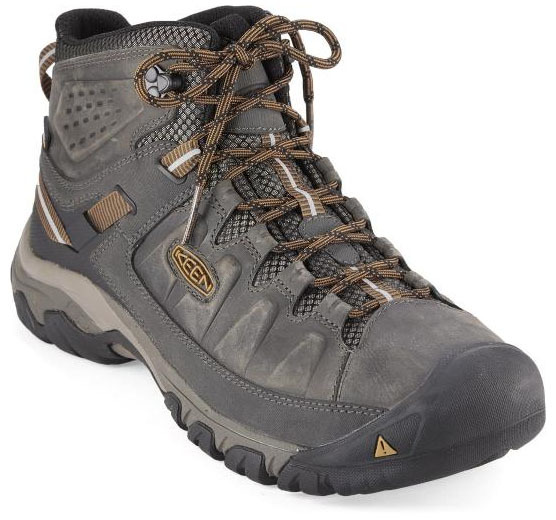 But if you need a precise and snug fit, the Talus Trek is a capable boot at an attractive price. Weight: 2 lb. 2.6 oz. What we like: Well built, extremely comfortable, and tough. What we don't: Pricey and not quite as supportive as some of the heavier boots on this list. When we think of Asolo, the classic Fugitive GTX below comes to mind, which weighs over 3 pounds and has looked the exact same for nearly a decade. The sleeker and more modern Falcon GV, however, represents where we think hiking footwear is headed: a little less weight and support than a traditional hiking boot, but with serious technical chops. 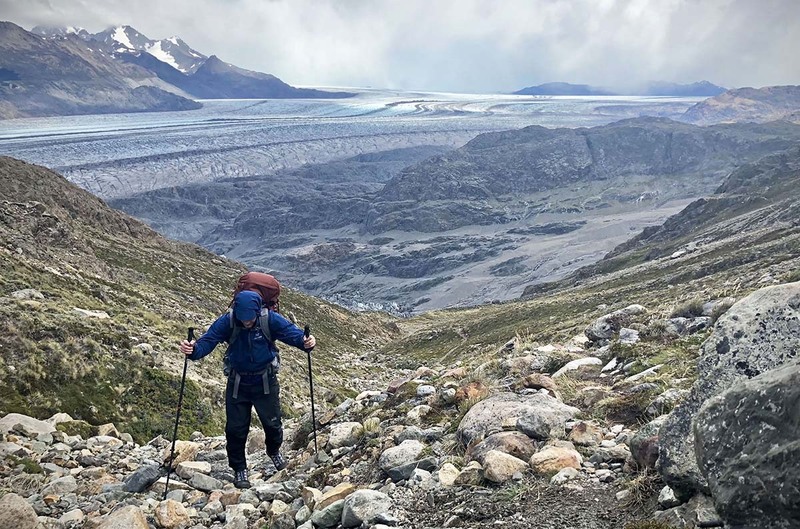 We took the Falcon on and off trail over the course of the rugged Huemul Circuit in Patagonia and came away impressed. It's well built, extremely comfortable right out of the box, and can handle just about anything you can throw at it. Weight: 2 lbs. 2.8 oz. What we like: Good budget option with a tough leather upper. What we don’t: Not very secure on rough trails. 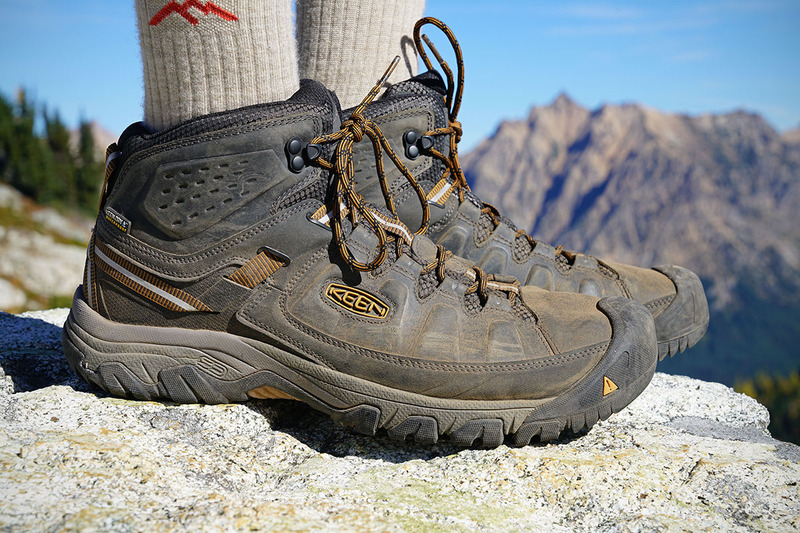 With an affordable price tag and great out-of-the-box comfort, the Keen Targhee line is an extremely popular boot for day hiking and easy to moderate backpacking trips. The Targhee III, released in fall of 2017, is $10 more than the older model but hones in comfort nicely (this boot is known for having a very wide fit, and the current version feels a little less wide in the toebox, which we like). Despite the reasonable price, the boot is surprisingly tough with a good-sized toe cap and leather upper, and it sits just high enough on the ankle to offer decent rollover protection. 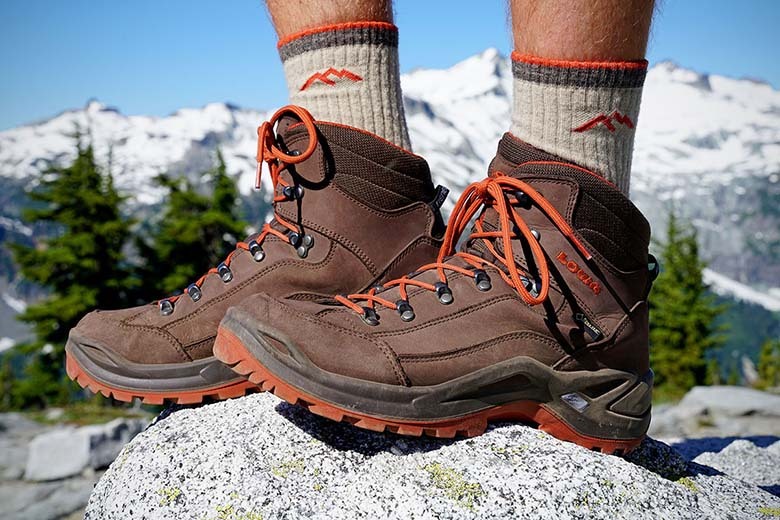 Keep in mind that the Targhee III still is a clear step down in stability and ankle support from a boot like the Lowa Renegade above, but it offers sufficient stability and grip for most subalpine adventures. What we like: Great mix of comfort, weight, and support. What we don’t: Step down in performance compared with the Quest 4D 3 above. Appearances can be deceiving with the Vasque St. Elias. What may look like a leather clunker from a distance actually is a fully modern boot that people love. Most impressive is the mix of support and comfort. With a heavy pack on, the EVA midsole and TPU shank offer enough stability and cushioning for putting on serious miles, but if you’re only heading out for a day hike, the boot is reasonably flexible and nimble. The St. Elias is also a good value, undercutting its primary competition above by $40 even with its tough, full-grain leather build. After leaving the design untouched for a number of years, Vasque revamped the popular model for 2019. Most notably, they upgraded the lacing hardware, which was a common source of failure in the prior version. In addition, the boot weighs 2 ounces less per pair, has a revised, more stable midsole, and features a sleeker look. 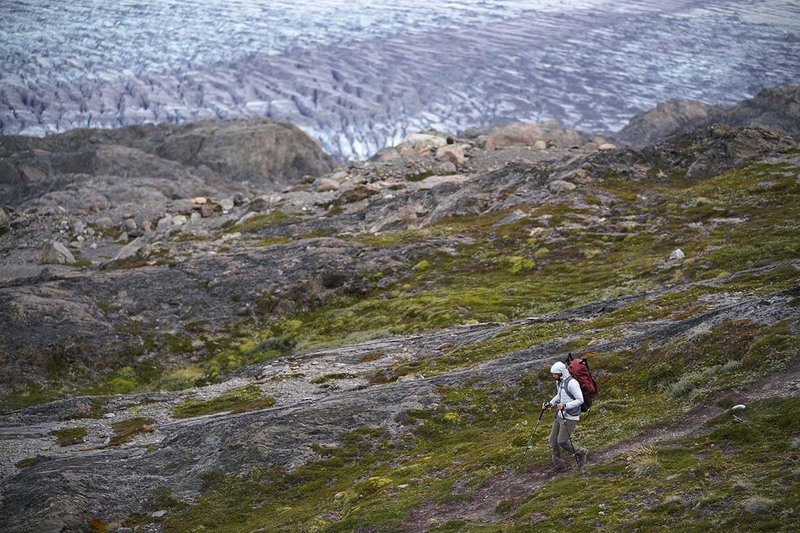 Even with the changes, it still can’t match the foot-hugging support and athletic feel of the Quest 4D 3 above, but we fully expect the new St. Elias to become a go-to option for all-around trail use. Weight: 2 lbs. 11.7 oz. What we like: Best-in-class protection and comfort. What we don’t: Pricey and overkill for easy terrain. Arc’teryx makes some of the best outerwear on the market, but is a relative newcomer to footwear. Our favorite from their hiking lineup is the Bora2 Mid GTX, which features a unique 2-piece construction with a removable stretch bootie (the $50 cheaper version without the "2" has sewn-in liners that cannot be removed). Over a multi-day backpacking trip in Utah’s Canyonlands National Park, we were impressed with how well the design works in warm conditions and on rocky terrain. 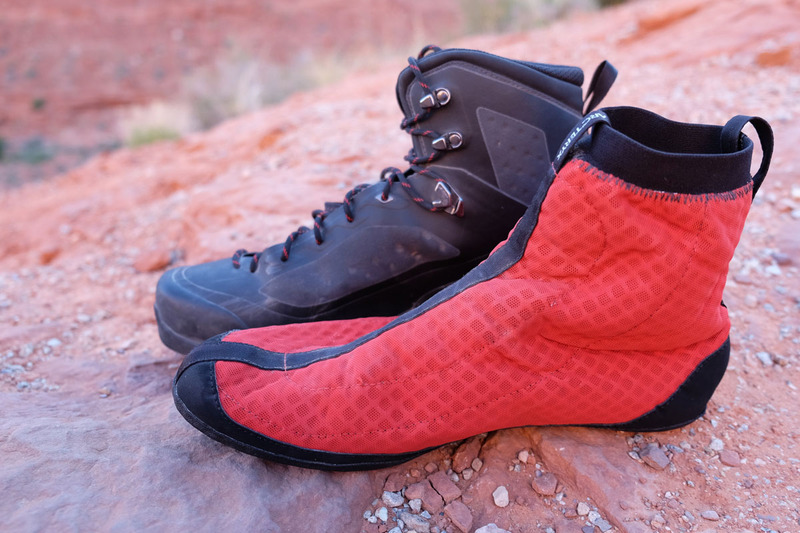 The liner was breathable and fit like a comfortable sock, and the tough outer shell offered great protection and gripped well on slickrock. What we like: Essentially a trail-running shoe with more stability. What we don’t: Limited protection and questionable durability. Altra’s Lone Peak trail-running shoes have developed a serious following among thru-hikers, making the mid-height hiking boot version an intriguing concept. Most notable is the impressively low weight of 1 pound 9 ounces per pair, which is the lightest on this list. You also get a very roomy toe box, a zero-drop profile, and a decently cushioned ride. We’ve included the non-waterproof mesh version here, but Altra also makes an RSM model with eVent that costs $160 and weighs a touch more at 1 pound 10 ounces total. In practice, we weren’t super impressed with the performance of the Altra Lone Peak 4.0 Mid, and particularly over rocky terrain. Our testers described the boot as a, “slipper with a higher ankle,” and the toe box was so roomy that it was too much for our normal-sized feet. In addition, underfoot protection was subpar off-trail and durability was concerning—the toe rubber peeled away from the shoe after just one long day hike. However, it’s worth noting that we did take the Altras on a challenging trip through Washington’s granite-filled Enchantments, and they may be enough boot for putting in mileage on well-trodden trails like the PCT and AT. But in those types of scenarios when ankle support isn’t a huge concern, the shoe version makes more sense than the boot, which is why we have the Lone Peak 4.0 Mid ranked here. Weight: 2 lbs. 1.6 oz. What we like: Light, pretty tough, and comfortable. What we don’t: A bit narrow and not a breakthrough in breathability. 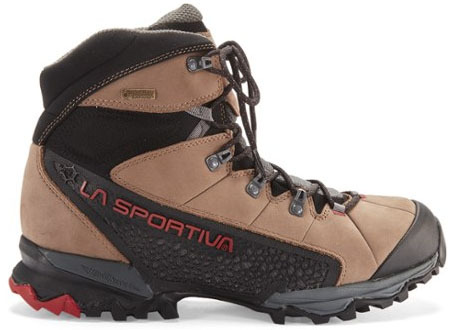 La Sportiva’s Nucleo High GTX is a quintessential modern boot: light and nimble but with enough support for day hiking and most backpacking trips. Its most notable features are the Gore-Tex Surround liner and Nano-cell technology. In short, Gore-Tex Surround breathes not only out the top of the foot like a traditional waterproof design, but also through the bottom of the footbed and out the sides. La Sportiva’s Nano-cell technology is the web-like mesh you see along the sides of the foot. While they give the boot a distinctive look, these cutouts only seem to have a modest impact on breathability. Where the Nucleo truly differentiates itself from other 2-pound models is durability: the boot has large swaths of leather rather than mesh for scrambling and hiking over rough terrain. You get moderate flexibility from its mid-height design, so it doesn’t require an extensive break-in, and traction is excellent over rock and mud. All told, the Nucleo a nice upgrade in performance and build quality from a boot like the Merrell Moab 2 above, albeit at a higher price. Keep in mind that this boot has a slightly narrow fit. Weight: 2 lbs. 15.2 oz. What we like: Burly combination of an approach and alpine shoe. What we don’t: Not everyone will like the stiff build and runs warm. Resembling a mix between an approach shoe and an alpine boot, the Salewa Mountain Trainer Mid GTX is designed for rough trails and harsh conditions (Salewa is a mountaineering and climbing company first). The boot features a protective rand that wraps around the entire lower section of the boot for total isolation from rocks, snow, and other trail debris. A further nod to the company’s climbing background is the lacing system, which extends all the way to the toes (most hiking boot laces end at the middle of the foot). This makes it easy to customize the fit, which is great for those with a wide forefoot and narrow heel or vice versa. The Mountain Trainer is most at home in rough environments, such as hikes above treeline or scrambling over rocks off trail. On a regular path the boot can feel heavy and overly stiff (this can be a benefit for those in need of strong lateral stability). For most hikes and backpacking trips, we still prefer the Salomon Quest, and the Arc’teryx Bora2 gets you similar levels of toughness but with a nimbler feel and better breathability. But for all-out protection and 4-season usability, it’s hard to beat these Salewas. What we like: Lots of support for the price. What we don’t: Feels clunky and slow on the trail. With its roots in Bozeman, Montana, Oboz has a reputation for making tough, comfort-first footwear. Our favorite over-the-ankle design from their line-up is the Sawtooth II Mid, which in many ways strikes us as a beefed-up version of the Merrell Moab 2. It’s plush and nicely cushioned underfoot, but lacks the lightness and flexibility of many modern options. The upside is that the boot is stable and tough—the upper can withstand a lot of abuse, and the thick outsole gives the shoe a planted feel. For anything from weekend backpacking trips to mild-weather snowshoeing in the winter, the Sawtooth II Mid is a solid choice. What’s not to like with the Oboz Sawtooth? On the trail, the boot feels quite a bit slower and heavier than competitors like the Merrell Moab 2 Mid or Keen Targhee III Mid. Further, even with expanded use of mesh in the upper with this latest iteration, the in-house BDry waterproof membrane makes the boot run very warm even in moderate temperatures. 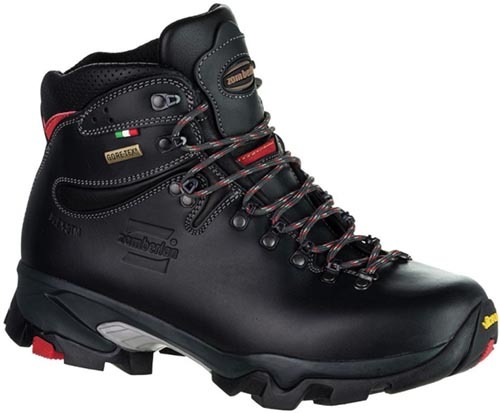 Those that are looking for a supportive boot at a competitive price will likely enjoy the Sawtooth, but its downsides are significant enough to drop it towards the bottom of our list. What we like: Classic Danner looks in a lightweight package. What we don’t: Not very durable or long-lasting. Danner is best known for their throwback, full-leather boots, but their Mountain 600 has struck a chord with the day hiking crowd. The over-the-ankle design is lightweight at 2 pounds 5 ounces for the pair, surprisingly flexible underfoot, and has sharp looks with a full suede upper and quality lacing hardware. An in-house waterproof liner combined with the water-resistant suede helps keep your feet protected from mud and wet grass, while also providing a light boost in warmth for wearing around town in the cold (to the detriment of breathability). As expected considering its casual slant, the Mountain 600 is not intended for high-mileage users. The materials aren’t known for holding up over the long haul, particularly if you subject them to rugged trails. 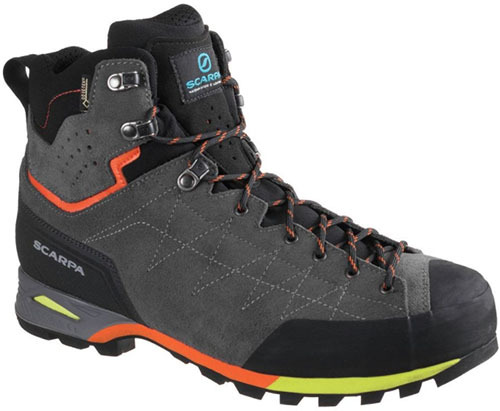 Further, the boot is pretty expensive at $180 when stacked up to more capable, lighter-weight designs like the $165 Salomon X Ultra 3 Mid above. But if you prioritize out-of-the-box comfort, styling, and everyday versatility, the Mountain 600 is worth a look. Weight: 3 lbs. 0.6 oz. What we like: Durable upper material. What we don’t: Stiff and heavy. In sharp contrast to the light and flexy Altra above, the Asolo Fugitive GTX follows a much more traditional boot design. And for some of our most demanding trips—including trekking through Nepal and Patagonia–the Fugitives were absolutely bomber. Their stiff construction and thick mid and outsoles isolate you from rocks, and the boots work well in 4-season conditions for snowshoeing or even light mountaineering. 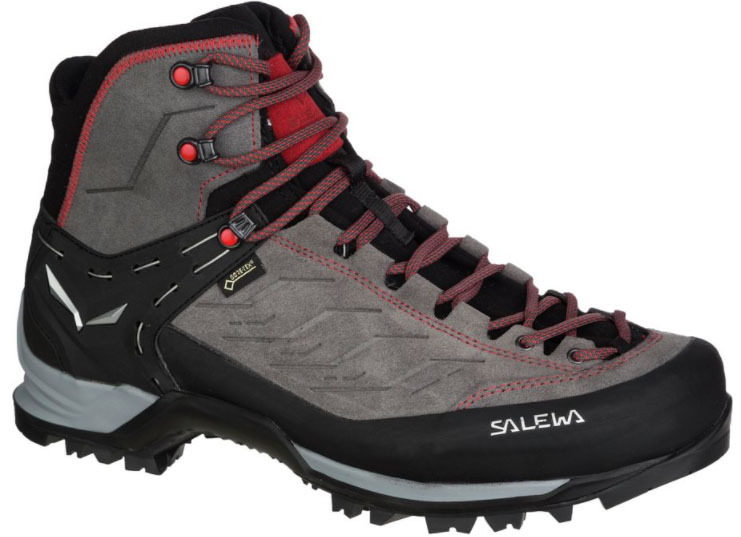 As tough boots go, the Fugitive is highly recommended and even costs the same as the Salomon Quest and Lowa Renegade above. With the burly construction comes more weight, and at over 3 pounds for the pair, they’re considered a heavyweight boot by today’s standards. Unless you need the ultra-tough build, the weight can be a downside over long distances (we prefer the Salomon and Lowa options for most of our backpacking needs). 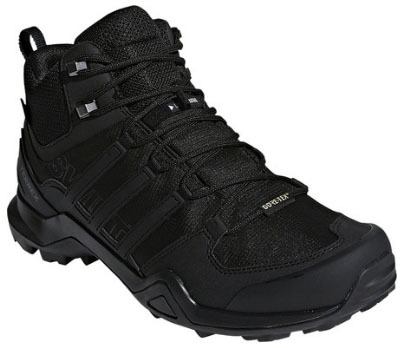 However, if you need a boot made for the alpine and like the stiffness and protection, the Fugitive remains a classic. What we like: Impressive traction and protection for the weight. What we don’t: The floppy ankle support doesn’t match the stiff design underfoot. Adidas may not yet be on the radar of the average outdoorsperson, but they have an impressive (and growing) line of hiking and trail-running gear. Their updated Swift R2 GTX boot is a great example. It offers approach shoe-like grip with a Continental outsole, Gore-Tex waterproofing, and plenty of toe and foot protection for under 2 pounds per pair. At $170, the Swift R2 is a formidable competitor to Salomon’s popular X Ultra 3 for fast and light adventures. The low-top version of the Swift R2 is one of our favorite hiking shoes, but we have mixed feelings about the boot model. Our biggest complaint is that the stiff and solid feeling underfoot doesn’t match the ankle support, which is pretty soft and flexible. This makes the boot a bit unpredictable on uneven or rough sections of trail—an issue we’ve never had with the low-top Swift. All told, we prefer the more complete Salomon X Ultra 3 design, but the Terrex gets a spot on our list due to its grippy outsole and light weight. What we like: Beautifully made and absolutely bomber on rough terrain. What we don’t: Dated design that’s very heavy. The hiking boot market has been trending away from traditional heavyweight leather designs for years, but there’s still a time and place for these classics. In this category, the Zamberlan Vioz GTX is among the all-time greats: the Italian-made leather construction is gorgeous and built to last, the interior is soft and isolates you amazingly well from a rough trail, and the stiff structure provides reliable support. For long slogs with a serious load or even light mountaineering, the Vioz GTX is a proven choice. Unfortunately for the Vioz, there is good reason why you see fewer of them on the trail these days. A heavy boot makes it that much harder to cover ground, and at 3 pounds 8 ounces, the Vioz weighs nearly a half pound more than anything else on this list (and certainly feels like it as the miles add up). In the end, we think even serious backpackers will be better off with a boot like the Salomon Quest 4D 3 above in most cases. But the Vioz remains a favorite among traditionalists who want a truly bomber boot that will be your hiking partner for years (you can even resole its Vibram rubber). 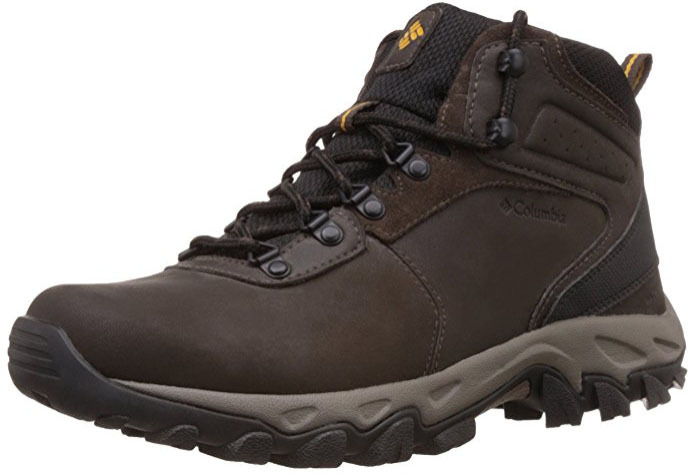 What we like: Leather and waterproof hiking boot at a bargain price. What we don’t: Not very breathable and limited support. 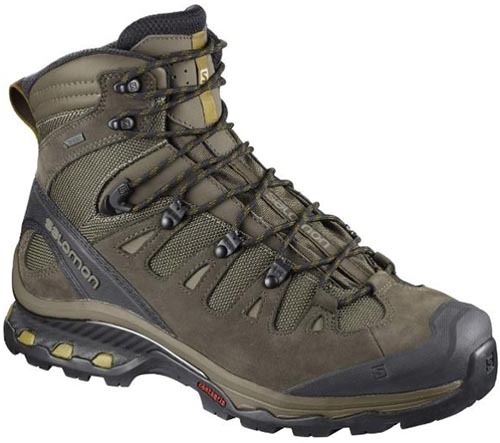 As bargain-priced hiking boots go, you would hard-press to find a better option than the Columbia Newton Ridge Plus II. It’s consistently on sale for well under its $90 retail price, yet has a leather upper and a completely waterproof, seam-sealed design. Further, the padded collar and tongue offer good comfort right out of the box. Against the competition, however, trail performance falls short of even the budget-oriented Targhee and Moab, with only a light amount of ankle support and limited breathability through the leather upper. What are the recommended uses for the Newton Ridge? It's not a boot we’d take on a 10-day backcountry trip, but performance should be completely adequate if you stick to moderate trails or are visiting the occasional national park. And the more casual styling makes it one of the better boots here to pull double-duty for daily wear (along with the Danner above). Boots in this lightweight category are, not surprisingly, light and flexible but tough enough for a longer day hike or short overnight backpacking trip. Options range from the budget-friendly Keen Targhee II to the light and fast Salomon X Ultra Mid 3. Waterproof liners are the norm, but they’re typically the less expensive type (read: non Gore-Tex). Materials used in the construction trend toward a heavy use of mesh and nylon with leather mixed in. This keeps cost and weight down, but doesn’t make them as durable as some pricier full-leather options. You also won’t see as stiff of a structure, as the boot’s shank and support won’t be very substantial. As long as you’re not carrying a heavy pack, that shouldn’t be a deterrent. Midweight boots are skilled compromisers, with enough support to carry a heavy load but without feeling like someone stuffed lead in your socks. It’s a rapidly growing category, reflecting demand from backpackers and serious day hikers for a light but capable option. It's also home to some of our favorite boots (the Salomon Quest 4D 3 and Lowa Renegade are both midweight). Solid support underfoot makes the boots a bit stiffer than your day hikers but not excessively so. Because of the quality of materials and construction techniques, prices in this category usually start at around $200. At that price point, the quality of the waterproof bootie improves and you’ll typically find GTX (Gore-Tex) in the name. Stiff, tough, and incredibly reliable, boot legends of the past were made in the heavyweight category. Classic models like the Asolo TPS 520 and Zamberlan Vioz GTX remain popular for those wanting a full-leather design, but the shift towards lighter weights in boot construction has expanded the category to include models like the Asolo Fugitive GTX. 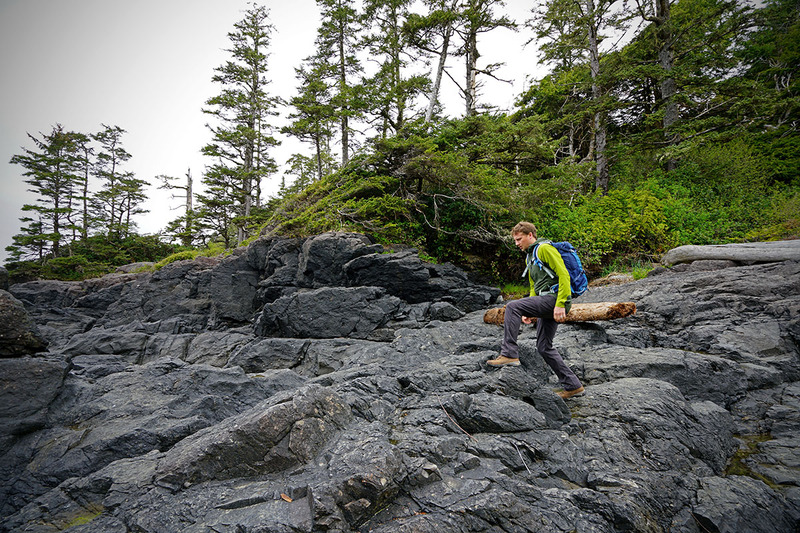 In general, heavyweight boots are built for tough, rocky trail and long slogs with heavy backpacking packs (they are also a great choice hiking with a loaded down baby carrier pack). While the thick upper materials and Gore-Tex make for excellent performance in the wet and snow, they will run warm in hot conditions (some prefer a non-waterproof leather boot instead). Their solid structure also takes some of the strain out of long ascents by keeping the heel from dropping at each step, and makes them often friendly with strap-on crampons for light mountaineering. 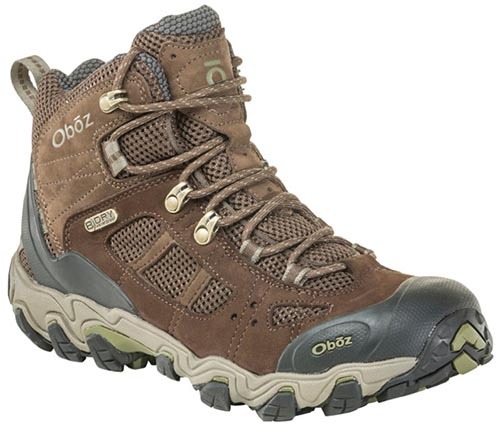 A final tip: don’t pick up one of these boots and head directly to the trailhead for a long trip. Spend the time to break them in and you’ll have a backpacking footwear partner for years to come. From a quick look at our comparison table above, it’s clear that hiking boot weights vary a lot. You can choose an over-the-ankle design anywhere from over 3 pounds to half that in the case of the Altra Lone Peak 4.0 Mid (essentially a trail runner with higher ankles and waterproofing). What’s equally obvious is how the various weights have an impact on a boot’s performance. To start, while the correlation isn’t perfect, a lighter boot generally will offer less support and lateral stability. If you’re carrying a heavy pack, this can present a problem, but for thru-hikers or minimalists, going lightweight can be a great idea. Whenever we can, we try and keep the weight of our boots to a minimum, providing enough comfort and support for the weight of our pack and the conditions, but without having to lug around anything extra. Depending on the trip, this can mean a lightweight trail-runner style for fastpacking all the way up to a burly boot like the Asolo Fugitive GTX for trekking through Nepal. If you’re going to choose one boot to do it all, the Salomon Quest 4D 3 GTX does a great job balancing weight and performance. One of the first decisions in choosing hiking footwear is selecting either an over-the-ankle boot or low-top shoe. Each style has its respective strengths, and we use them interchangeably for hiking and backpacking trips. We’ve found that hiking shoe models vary just as much as the boots listed above, so you can choose from stiff and supportive down to light and nimble. In the end, the differentiators are ankle protection and stability. For rocky terrain, water crossing, snow, and for carrying a backpacking pack, a boot is our preferred option. But the low-top style trims away material and weight, making it the clear choice for those focused on moving fast and light without a large pack. There isn’t a definite right answer in this debate, but the weight of your gear and the conditions you’ll be hiking in can make the decision a lot simpler. In general, a hiking boot is designed to be stable, which typically involves a piece of hard plastic inserted between the midsole and outsole, known as a shank. The length of the plastic can vary from just under the arch to the full-length of the boot, depending on intended use. The benefit of a stiff boot is that the heel will not drop on an ascent, which helps reduce calf fatigue. This is why the stiffness of a boot will increase along with its technical abilities, culminating in extremely unyielding mountaineering boots that can better handle long summit pushes. 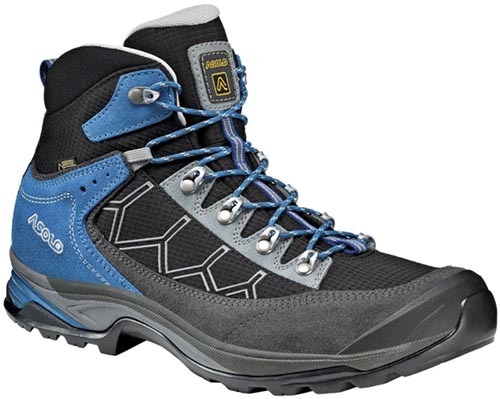 On the other end of the spectrum, some lightweight boots do not have this additional structure, instead resembling a tall, flexible hiking shoe. For day hikes on flatter or less technical terrain or if you're aiming to move fast and light, we can’t recommend a lightweight and flexible hiking boot enough. Shoes like the Altra Lone Peak 4.0 or Salomon X Ultra Mid are standouts for these uses. As your trips get longer and your pack gets heavier, a more substantial boot that increases ankle support is a better decision. Look to the Lowa Renegade or Salomon Quest 4D 3 for a great all-around option that is equally adept at conquering summit peaks and multi-day backpacking. 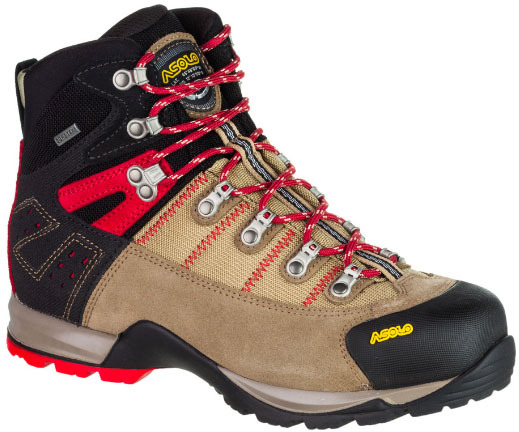 On the extreme end, heavyweight boots like the Asolo TPS are excellent for hiking in areas that require maximum support: off-trail bushwhacking, traversing an exposed area or trekking over rough ground. The vast majority of hiking boots are waterproof, and the security from a surprise deluge on a backpacking trip is reason enough for most folks to choose a GTX (Gore-Tex) model. To make these boots waterproof, most designs have a waterproof and breathable bootie inserted between the outer fabric and interior of the shoe. Gore-Tex liners are the most popular and have the brand cachet, but even in-house technologies like Keen’s Keen.Dry are similar in terms of waterproofing performance (it’s breathability where they’ll differ). In addition, a water-repellent coating is added to the boot to help bead up and shed water droplets. Most hiking boots are waterproof, but does that necessarily mean they should be? It’s nice to have waterproofing so your feet don’t get wet walking through mud or crossing a stream, but all the waterproofing does on a spring or summer backpacking trip in Canyonlands is make your feet hot and sweaty (we cover breathability in greater detail below). And an argument can be made that your feet will eventually get soaked no matter the waterproof design in truly wet and miserable conditions. As an alternative, some backpackers turn to non-waterproof shoes with gaiters over the top for weather protection. While this won’t keep water from entering at the sides, the boots will dry much quicker. And the gaiters keep water, snow, or trail debris from entering over the top of the boot. 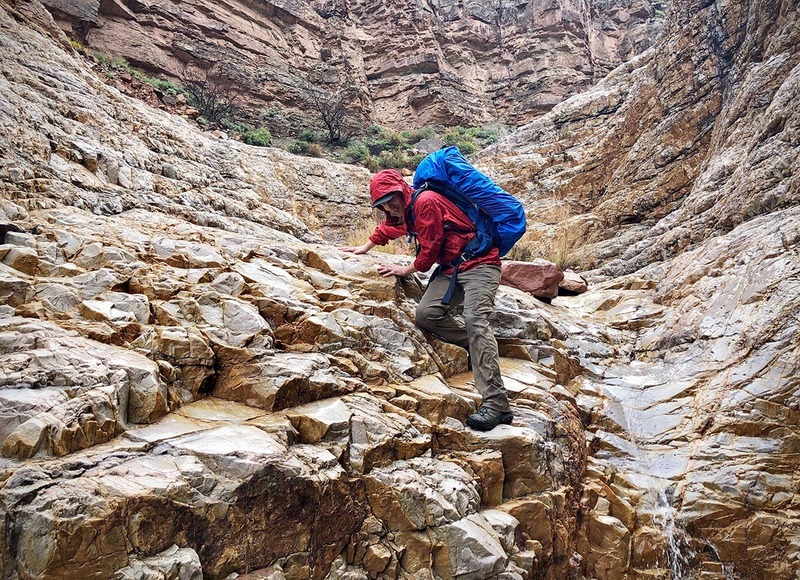 Our take on waterproofing is that it’s best for most folks, and particularly those that venture out in mountainous regions where water on the trail or a rainstorm always are possibilities. The designs aren’t perfect, but a quality waterproof lining will keep you reasonably dry in all but the worst weather. And if you hike in the shoulder seasons, the extra layer adds some insulation from the cold. But hikers in uniquely hot and dry places like Arizona and Utah may be best served with a non-waterproof model, no matter how few options there are on the market. Two that we like are the Merrell Moab 2 Ventilator (a sibling of the Moab Mid WP on this list), and Lowa Sesto, essentially a trimmed-down Lowa Renegade with its Gore-Tex liner removed. No matter what marketers say, making a boot waterproof inherently impacts breathability. By keeping water from entering from the outside, less moisture (your sweat) can quickly and easily escape from the inside, which means all forms of waterproof footwear can run warm in the summer months. There are, however, big differences between boot models in their ability to ventilate. We’ve found that heavyweight leather boots with a Gore-Tex lining are often the worst performers, while the Gore-Tex Surround in the mesh-heavy La Sportiva Nucleo and the two-piece design in the Arc’teryx Bora2 (see our in-depth review) are a step above. In between, the Lowa Renegade and Salomon Quest 4D 3 both perform decently with their nylon and leather construction and Gore-Tex liners, and are completely suitable for summer backpacking trips. The cheaper membrane in the Keen Durand Mid boot fell short of those pricier options in our testing. Alternatively, if you are willing and able to ditch the waterproof lining altogether, the Merrell Moab Ventilator Mid and Lowa Sesto Mid mentioned above are great options for casual hikers and backpackers, respectively. 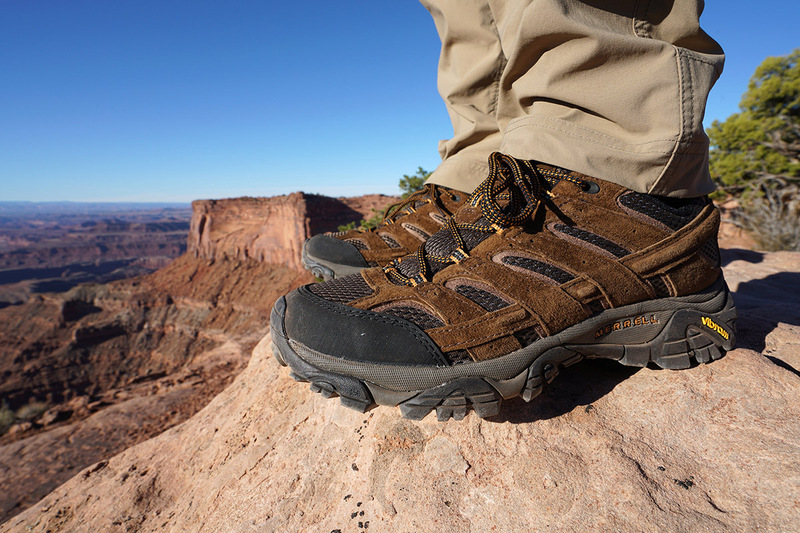 Laces are an overlooked feature on hiking boots but play an important role in fit and comfort. If a shoe has a poor lacing system prone to loosening, you’ll find yourself having to readjust constantly on the trail or dealing with hot spots and blisters. 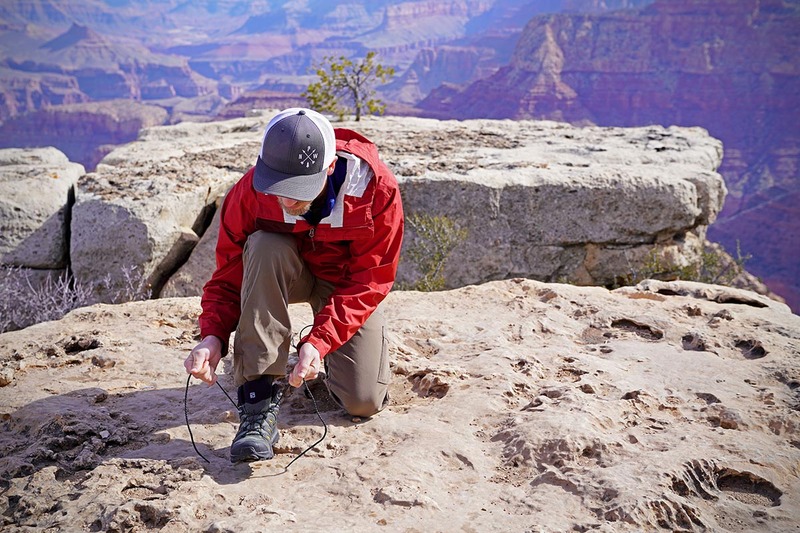 If the culprit is just the laces themselves, it’s an easy fix: there are many quality replacement laces available (and can usually be found at a local outdoors shop). But if the system doesn’t hold your foot or fit very well, we recommend looking elsewhere. For this reason, we are hesitant to recommend the single-pull speed lace designs from Salomon and Adidas. Although convenient, it can be more difficult to customize fit, which can lead to discomfort over long miles and when wearing a heavy pack. As you upgrade to more aggressive designs, the lacing systems also should advance. Notable upgrades for boots include locking hooks near the bend at the ankle, such as what you get on the Quest or Renegade boots. These hooks keep the laces in place extremely well, which increases comfort and on-trail performance. The type of material used in a shoe’s upper, which is the fabric that connects to the rubber outsole, correlates directly with its durability, water resistance and ability to breathe. Most often, a boot or shoe will be made with a mix of synthetic (typically nylon), mesh, and leather. There are exceptions, particularly at the high-end with one-piece leather constructions. 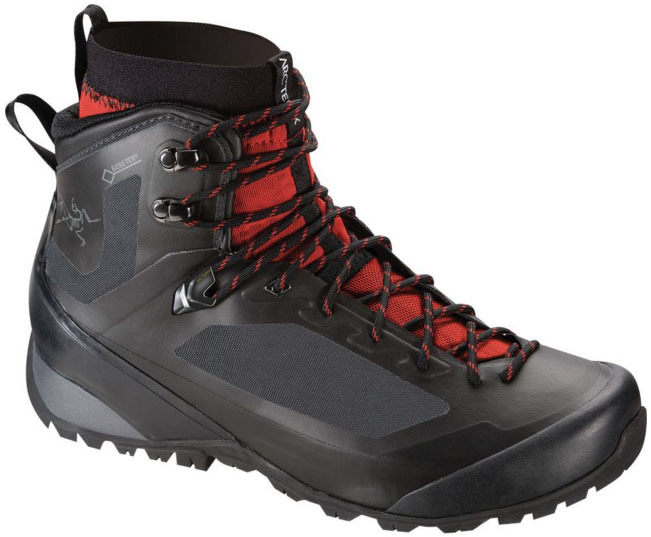 As we mentioned above, Arc’teryx is one brand that breaks from the mold completely with a separate rigid thermolaminated outer that connects directly to the sole. Below we spell out the pros and cons for the most common materials used for hiking footwear. Woven nylon as well as open mesh nylon panels are common on entry and mid-level boots to aid in breathability. They’re not as well known for their durability but do a great job of cutting weight. Moreover, the fabric can absorb moisture faster than a leather boot. 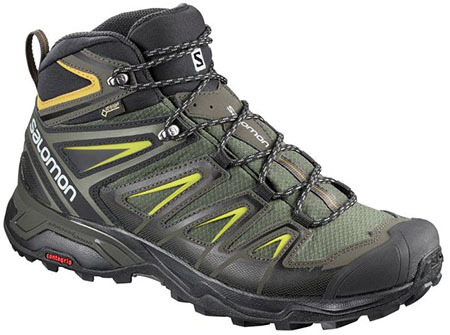 Exceptions include the Salomon Quest 4D, which is made of tightly woven nylon panels that have comparable levels of durability to some Nubuck leathers despite a lot of exterior stitching. Made of full grain leather, but given a brushed finish that has a suede-like feel, Nubuck leather is a common site on mid-range boots. The softer touch leather is lighter and more flexible than traditional, glossy full-leather options, but the thinner construction isn't as durable. It is, however, more durable than most nylon mesh inserts, and as a result, it’s common to find a mix of Nubuck leather and mesh, with the leather bits giving the boots a little extra toughness. Additionally, Nubuck leather tends to breathe better than full-grain leather and isn’t as prone to showing scuffmarks thanks to its brushed finish. This type of upper is most often found on tough, heavyweight boots. You’ll find one-piece leather uppers on high-end boots like the Asolo TPS 520 or in Danner’s boot collection. These designs are not light or as breathable, but are incredibly tough and water resistant. They do require some maintenance to keep the leather in good shape, but they’ll reward those cleaning efforts with a construction that is built to outlast everything else on the market. 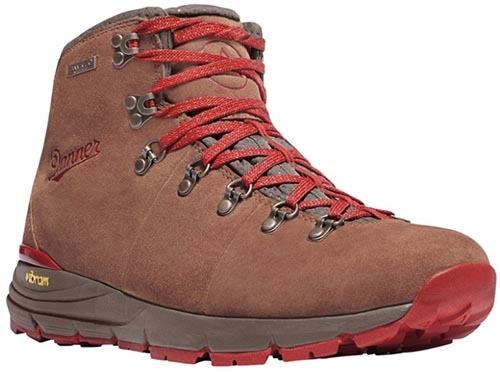 As an added bonus, some boots like the Danner Mountain Light can be re-soled, so you don’t need to replace the whole boot once you wear down the lugs. 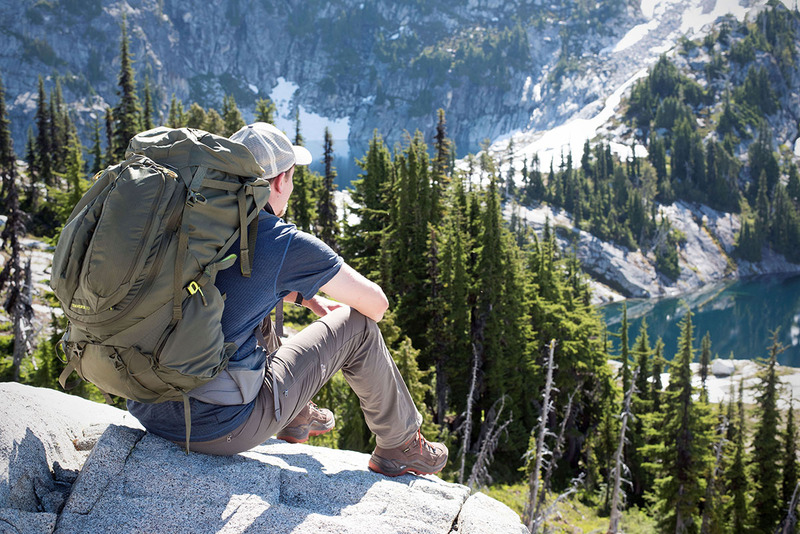 While wearing hiking boots, it’s common to carry a decent amount of weight, which puts a lot of stress on your feet. Combined with the rubber outsole, the midsole plays the essential role of shock absorber from impacts and provides an additional layer of protection from sharp rocks. 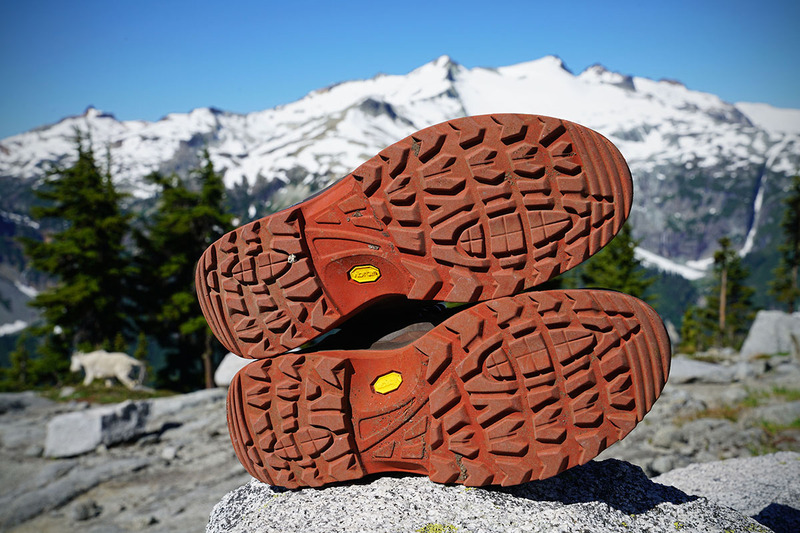 Depending on the design, midsoles vary from very thin (fastpacking boot) to stiff and substantial (full leather hiking boot). Most include EVA foam, PU, or a combination of both in their construction. 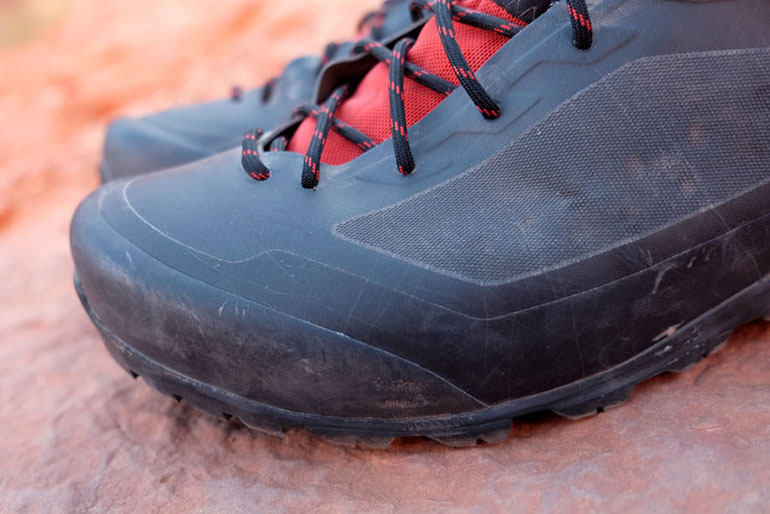 The majority of light and midweight hiking boots use EVA foam in the midsole. The cushy soft material takes some of the sting out of your heel or midfoot impacts and is also extremely lightweight. Not all EVA should be treated equally, and the proprietary versions can vary from super soft to mildly stiff. For logging serious miles on tougher terrain, we prefer a firm and supportive midsole as opposed to too much cushioning. Those overly-soft midsoles also have a tendency to break down over time, much like a road running shoe. In general, you pay more for an improved midsole design and a higher quality EVA compound. For tougher applications or when it’s a priority to isolate your feet from rough impacts, manufactures will use a PU or polyurethane midsole. This durable foam is far less cushy than midsoles with only EVA but will last longer and better handle a heavier load. In addition, they’ll keep their shape longer and won’t be prone to compressing like EVA. Boots like the Asolo TPS 520 Evo use a polyurethane insole, but the material’s popularity is expanding to mid-range options—despite the extra cost—with the Scarpa Zodiac Plus being a recent example. The motivation behind upgrading from a flimsy cross trainer to a real hiking boot or shoe often is for improved traction. In a way that more casual footwear can never match, hiking footwear is leaps and bounds better when the going gets rocky, slippery and steep. And much in the same way that Gore-Tex dominates the market for mid to high-end waterproofing, Vibram inhabits a similar space for outsoles. Not all Vibram models should be treated as equals, however, as the rubber manufacturer tailors their designs for the specific footwear and brand. Some have much larger lugs underfoot for serious grip in mud (Vasque St. Elias), and others prioritize sticky rubber for scrambling over rocks (Arc'teryx Bora2). There are also more entry-level options that just do well on easier trails, like the lugs you’ll find on the bottom of the Merrell Moab boots and shoes. The lesson is it's worth taking a look at the lug depth and description of the compound type to find out where a specific outsole will perform best. Salomon is one brand that doesn’t outsource their traction needs. Instead, they use their in-house ContraGrip brand for all of their boots and shoes models. And with years of experience in everything from trail running to hiking, they aren’t short on expertise. The level of quality and performance is in-line with the Vibram offerings across the board, from anything from their fast-and-light X Ultra Mid hiking boots to the burly Salomon Quest 4D 3 backpacking boots. Toe caps or rubber rands cover the front of many hiking boots, and we consider them an essential element of backpacking boot design. These thick pieces of rubber are there to keep your toes in one piece should you accidentally—and in our case, eventually—kick a rock on the trail. Some standouts from our list above include the Arc’teryx Bora2 and Salewa Mountain Trainer, which have protection that wraps completely around the front of the foot. To cut weight, some manufacturers will occasionally take away or diminish this feature, including the Altra Lone Peak 3.0 boots. Speaking from experience, we’d prefer that Altra included a more substantial one after catching and bruising a toe on a rock hiking in Washington's Enchantments. If you go lightweight, toe protection is one area where you may sacrifice. Getting a proper fit can be a real pain, and in many cases the blame is a generic, flat insole. Thankfully, removing your stock insoles is super easy, and replacing them with an aftermarket model that’s specific to your foot size and shape can remedy most shoe maladies. New insoles can provide more or less volume to fill out the shoe, improve the fit under the arch, and increase or decrease the cushion and impact shock. We recommend checking out Superfeet insoles for their wide selection of options and trusted reputation in daily shoes, ski boots, and hiking footwear.